We are experiencing temperatures well below average this weekend in Chicago, so it seemed like an ideal opportunity to turn on the oven. I was in a bagel kind of mood, so that is what I decided to make. Bagels are deceptively easy to make. I always thought they would be a lot of trouble, maybe more trouble than they are worth. Which says a lot, because I think they are actually worth a lot. I have a memory of my father making bagels. I must have been about 3 or 4 years old, and it was one of those rare occasions when he was home (he was a traveling salesman at the time). It must have been a weekend, but every day was pretty much the same to me so I can't say for sure. When it was time to shape the bagels, he turned the balls of dough over to me and instructed me to roll them into snakes, and then shape the snakes into circles. I knew how to do that because I had already rolled out many Play-doh snakes in my short time on the planet, so I felt confident in my ability. I don't remember if my father told me to be sure that the circles were well secured, or if he checked my work, but according to my brother they came apart in the water bath and we ended up with bagel snakes instead of bagels. I don't remember that. All I remember is that they were delicious. But whatever you do, I suggest you make them. It is virtually impossible to get real bagels, even in a big city like Chicago. What most people call bagels is just bread in a circle. Real bagels have a tough, chewy exterior with a dense, chewy interior. At least the bagels I grew up with were like that. These come the closest to my childhood memories. Close enough that a co-worker who came into my office and saw one I had brought in for breakfast asked me where I got the real bagel. I told her I made them and gave her one, which she took home and toasted for lunch. When she came back, she agreed it was the real deal. That's all the validation I need! The first time I made them I used different toppings - sesame seed, poppy seeds, garlic, and plain. After that, I realized that sesame seeds are my favorite so I just started making them all sesame seed bagels. Obviously, your mileage may vary. The original recipe has you divide the dough into 10 pieces, roll them into balls, and use your thumb to make the hole. They made pretty enough bagels, but did not seem quite authentic to me. For the next batch I tried rolling the dough into snakes and making a circle out of them. I liked the way they looked more, although they were not quite as even and consistent as the thumb-punching method. Either way is fine, but if you use the snake-rolling method, be sure to roll the ends together well so they don't come apart when they are boiled. I have included both methods in the recipe below. Measure 3 cups flour into a large mixing bowl. Add the rest of the dry ingredients and whisk together. Add the hot water and, with a wooden spoon, stir it in vigorously. Add the rest of the flour, a little bit at a time, until the dough gets thick and heavy. Turn it out onto a floured work surface. Oil the mixing bowl. Knead the dough for about ten minutes, until it is firm and solid. Add flour as necessary. Form it into a ball and place it top side down in the oiled mixing bowl. Twirl the dough around in the oil and then turn it over so the oiled side is now on top. Cover the bowl with plastic wrap and let it rise until doubled, about one hour. While the dough is rising, fill a large saucepan with 3 to 4 quarts of water and bring to a boil. Add the malt syrup or sugar and turn it down to a simmer. The water should just barely be moving. At this time, prepare a large baking sheet by covering it with parchment paper and then sprinkling cornmeal over the parchment paper. Turn the dough out onto a lightly-floured work surface and punch it down with your fingertips. Divide the dough into 12 even pieces and let them rest for 2 to 3 minutes. Take each piece and roll it into a long strip by applying pressure with both hands in the middle. You want the ends to be thicker than the middle. Wrap the rolled out strip around your hand, overlapping the two thicker ends across your palm. Roll the two edges together, palm down against the work surface, until they are well connected and you have a circle of dough. Lay it on the work surface to rest and repeat with the rest of the pieces. Turn the dough out onto a lightly-floured work surface and punch it down with your fingertips. Divide the dough into 12 even pieces and form them into balls. Allow them to relax 2 to 3 minutes, then flatten them slightly. With your thumb, press down in the middle of the bagel and work it through the dough. Twirl the dough between your two index fingers until it is about two inches wide and then put it back on the work surface (the hole will shirnk back once you put it down). Do the same until you have ten bagels shaped. Working in batches of two or three, place each bagel carefully in the simmering water. Cook for one minute, turning them over halfway. Remove them carefully and drain them briefly on a towel, and then place them on a baking sheet covered with parchment paper. If you are not using parchment paper, grease the baking sheet. It is ok to place them close together; they can even be touching. 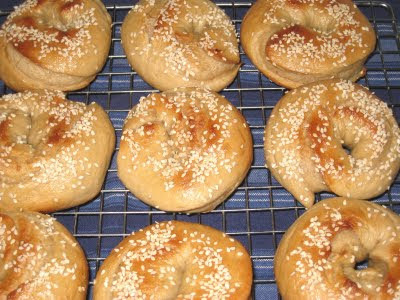 When all of the bagels are done, brush the tops lightly with the egg wash, and then sprinkle on the toppings - sesame seeds, poppy seeds, garlic, onion, or salt. Or, you can leave them plain. Put the baking sheet in the middle oven rack and cook for 25 to 30 minutes. After about ten minutes, when the tops have just started to brown, turn the bagels over so they will stay round. Remove them from the oven when they are shiny and brown. Place on a metal rack to cool. *any combination of bread, all-purpose, or whole wheat flour will work here. I have been using half white whole wheat and half bread flour. I think next time I will use all white whole wheat flour. These look fantastic. I can almost close my eyes and smell the delicious fragrance as they are baking! Thank you! They smelled just like bagels while they were baking - something that surprises me every time.